Do you blush or flush easily and often? When you look at your reflection, do you see redness in the center of your face? Do you also see acne-like breakouts even though your teenage years ended decades ago? Where you have redness, do you see tiny veins? If so you may have a form of rosacea. Symptoms include redness across the nose and cheeks which can spread to the chin or forehead, acne-like breakouts, small red veins on the cheeks or nose and dry irritated eyes. It is a common problem and often occurs in people between 30 and 60 years of age who are often fair-skinned. Many people can avoid rosacea flare-ups by avoiding things that trigger it, such as: spicy foods, hot drinks, caffeine, and alcohol. Determining your personal trigger can take a bit of detective work. The best method is to keep a journal of various exposures and foods eaten when having a rosacea flare up. 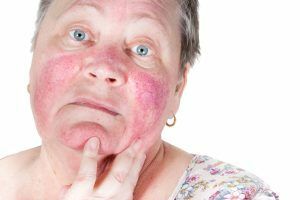 There are many different treatment options for rosacea including prescription topical metronidazole, Soolantra and Mirvaso. We also offer oral antibiotic treatments and laser therapy, which is a more effective treatment option for those with moderate to severe symptoms. For a small group of people with rosacea, the skin on the nose can enlarge and grow thick. This is called “rhinophyma.” The nose enlarges and thick bumps can form on it. At Kentucky Dermatology, we have treatment options to improve the appearance of rhinophyma which included oral medication and surgery.